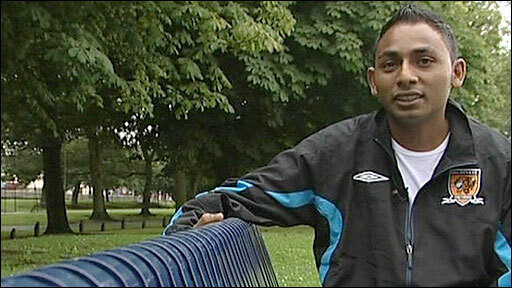 Unemployed Syeed Ali: "I'm sick of being on benefits"
The number of people out of work in the UK has risen to its highest level since 1995, official figures have shown. Unemployment increased by 220,000 to 2,435,000 in the three months to June, taking the jobless rate to 7.8%. Claims for unemployment benefit were the highest in 12 years, increasing by 24,900 in July to 1.58 million. Average earnings, excluding bonuses, grew at their slowest rate since records began in 2001, the Office for National Statistics said. Earnings excluding bonuses rose at an annual rate of 2.5% in the three months to June, down from 2.6% in the three months to May. Those in manufacturing only averaged pay increases of 1.1%, while the public sector saw an average rise of 3.7%. Average earnings including bonuses also rose by 2.5%, but this was up from the previous rate of 2.3%. BBC employment correspondent Martin Shankleman says the figures confirm that unemployment continues to rise remorselessly, with no early respite. Our correspondent adds that the full impact of joblessness among those who recently left school or college and are now looking for work is not reflected in these figures and has yet to be felt. The figures come as the Bank of England's latest quarterly inflation report warned that the UK economy still had some way to go before it recovered from the effects of the financial crisis. Bank governor Mervyn King warned that any recovery in 2010 would be "slow and protracted". He also hinted that further measures might be needed to stimulate the economy, in addition to the Bank's programme of quantitative easing (QE) to spur growth. The British Chambers of Commerce warned that unemployment was likely to continue rising at a rapid pace, even if the economy started growing again, and could exceed three million. And the Institute of Directors said that almost a million people were working part-time because they could not find a full-time job, meaning the impact of the recession on employment was "even greater than the headline figures suggest". According to BBC calculations based on ONS data, the unemployment rate among 16-24 year olds has risen to 19.1%, with about 928,000 people in that age range classed as unemployed. There is rising concern about youth unemployment, and Business Secretary Lord Mandelson said the government needed the help of businesses to tackle it. Work experience, mentoring and internships were needed to avoid a generation "lost to work", Lord Mandelson told the BBC. "This is something the whole country has got to rally to. We need public and private employers, as well as those in the [charity] sector, to help us mount this national campaign to back young Britain." However, shadow chancellor George Osborne said the government was not doing enough. "Unemployment continues to rise, month after month, we are facing a lost generation of young people who can't get work," he said. "The government talk about all their unemployment schemes that are supposed to help, but at the moment we've just got people losing their jobs and getting very little help in trying to find a new one." A group called the Youth Fight for Jobs Campaign says there is a lack of training and affordable housing for younger people. "It's about highlighting that there's a problem, and also saying to the government, and local MPs, and councillors, what are you going to do about it?," said campaigner Manuel Dominguez. "Young people don't get proper training, a lot of working class young people get put off from going to university and being saddled with debt." A new crop of school leavers and university graduates will join the jobs market this summer. The number of new claimants of job seekers allowance had been falling in recent months, but the 24,900 fresh claimants in July compared with 21,500 in June. Earlier this week, the government said it had launched an investigation into the gap between the number of people out of work and those who were claiming unemployment benefit. While the latest data shows that the jobless rate, under International Labour Organisation (ILO) rules, rose to 7.8% in the three months to June - the highest rate since the final quarter of 1996, the rate of people claiming unemployment benefit in July was just 4.9%. One possible explanation for this discrepancy could be that some people who have recently lost their jobs are relying on their partner's income, their own savings or redundancy payments rather than drawing on benefits. "Recently the broader ILO measure of joblessness has indicated a more marked weakening in the labour market, and that trend has continued," said Colin Ellis, European economist at Daiwa Securities. 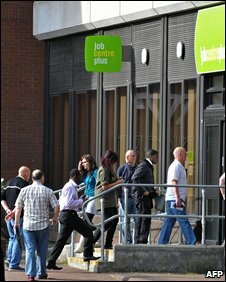 Meanwhile, an investigation by Radio 4's Face the Facts has found that some frontline staff at Jobcentre Plus, the government agency tasked with getting people back to work, are cutting interview times to cope with the increase in claimants. However, Employment Minister Angela Eagle dismissed the idea that government cuts to the agency before the recession were proving detrimental to those out of work, saying staff had done "a magnificent job in difficult circumstances". She added that 9,000 new staff had been recruited and that 80% of people registering after they had lost their jobs were getting an interview with a personal adviser within three days. Benefits payments were also being processed "well within targets", she said.